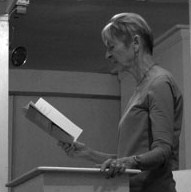 Caroline Knox's seventh collection, Nine Worthies, will appear from Wave Books (www.wavepoetry.com) in September 2010. Her sixth, Quaker Guns (Wave 2008), received a Recommended Reading Award 2009 from the Massachusetts Center for the Book. The term in the poem "Singing in Yoghurt" refers to the global pop-rock phenomenon of introducing foreign and perhaps not understood words into one's poetry and song (Henry Hitchings, The Secret Life of Words, Farrar Straus 2008, 337). of autumnal flat creeping thyme. Not only thyme but salt, magical seasonings. hand over hand and year after year. it's Paddle your own canoe. Pas de lieu Rhône connu? Noplace known in Rhône? WHAT? "There was a hypoon, and the ship went underboard." Or macaroni on the yoghurt. it was goulash, all paprika and fire. you were completely grateful and reliable.